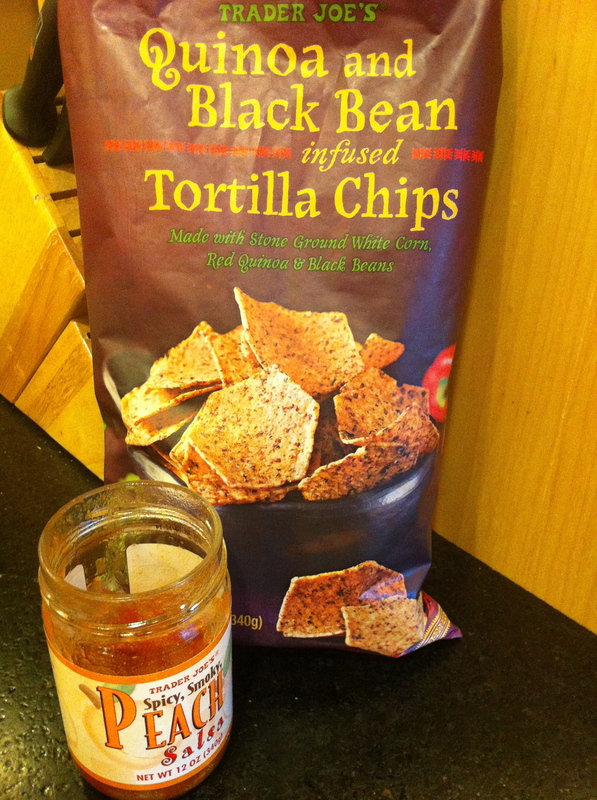 All the Trader Joe chatter is about these things lately: Quinoa and Black Bean infused Tortilla Chips. I bought a bag to try at home. Gone in sixty seconds. I went back to the store to buy ten bags and they were gone from the shelves. I asked a crew member if there were any in the back and he, and a few more crew members, burst out laughing. "Girl, those chips became like Peppermint Joe-Joes. People are lining up at the truck for them!" "Have you tried our Tri-Color Quinoa yet?" We turned as one, eyebrows raised. Pardon? 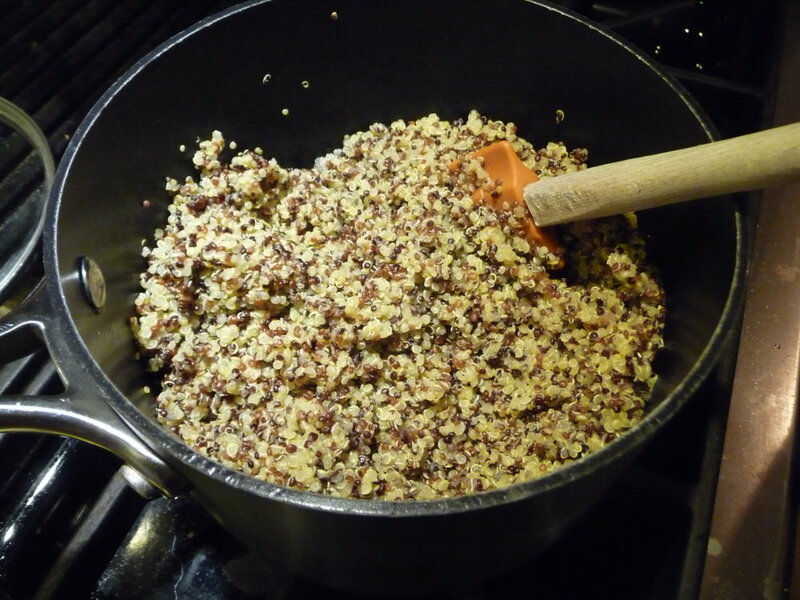 "The Tri-Color Quinoa. Over in the pasta aisle. There's a recipe on the back of the package for Black Bean & Quinoa fritters that sounds like it would be great with the peach salsa, too." I was gone. I love black bean fritters to begin with, and this sounded really good. I ended up not following the recipe to the letter because I was too lazy to get out the food processor. I'll leave it up to you to try their way. Here's my way. Combine all ingredients in a large bowl. Actually, if you combine all without the egg, you could stop here, add a vinaigrette and end up with a very nice salad. But add the egg, mix it all up. Heat olive oil in a heavy skillet over medium-high heat. 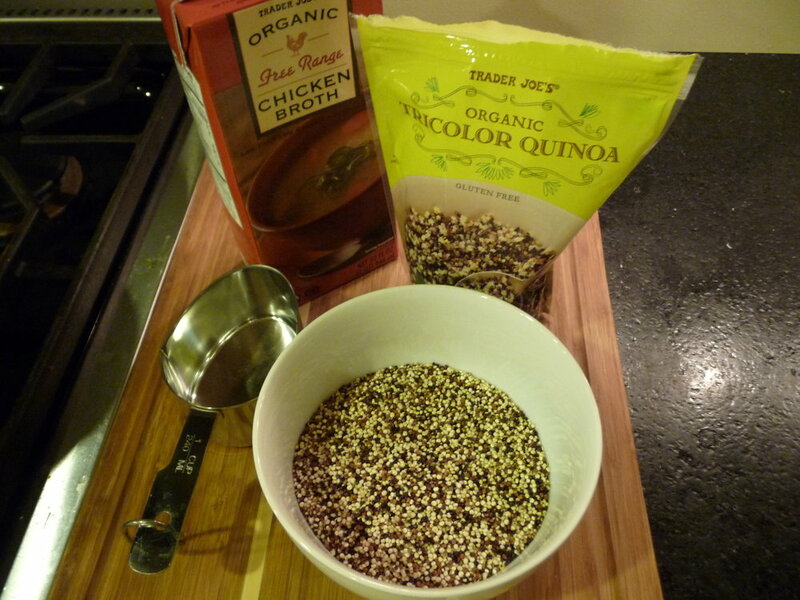 Scoop up a generous tablespoon of quinoa, drop gently into the oil and gently flatten into a patty. My first batch fell apart and I needed to add the third egg. Fry until brown on both sides and drain on paper towels. To go along with these babies, I had a salad spinner basket full of greens from the garden: yellow swiss chard, beet tops, and leaves from Purple Peacock Broccoli, which is a cross between broccoli and kale so the leaves are edible. To prep the greens, I had something from the Department of I've Been Meaning to Do This for Years but Never Got Around to It: flavored olive oil. I don't know what's taken me so long, it's not like this is a time-consuming, labor-intensive chore. I guess it was just being in Homegoods and finding a couple of glass bottles for olive oil on clearance and deciding one of them would be exclusively for herb-infused oil. And there's nothing to this at all: wash and dry sprigs of thyme, rosemary, oregano, whatever you want, and cram them into the bottle. Peel and smash a few cloves of garlic, slice them lengthwise so you can get them through the neck of the bottle too. Add a pinch of red pepper flakes. Then funnel in your olive oil. Stop up the bottle, let it sit a few days. Next thing you know you're using it to sauté everything, dunking bread in it, drizzling it over pasta. When the oil runs out, just pour more in. And be sure you arrange it on a cutting board with a bouquet of just-picked roses and a lemon, because that's what all the cool people do. So here's the Money Shot of sautéed greens and quinoa-black bean fritters. Amazing how that entire basket of greens cooked down to a wilted lump. But fabulous cooked down in the infused oil and then braised with a little added chicken broth. Top the fritters with a spoonful of peach salsa and you are in business. Trader Joe's pre-cooked turkey meatballs are the bomb. I'm never without two or three bags of them in the downstairs freezer. These things have to be terrible for you, the sodium content is probably off the chart. But they are always there when I need them. 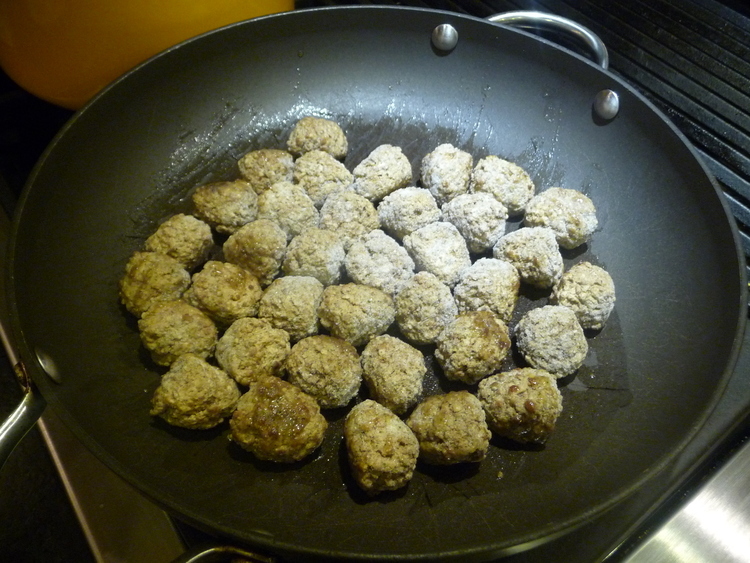 And when you have four different people with four different ideas for dinner, meatballs are the common thread. Case in point, tonight. I was wanting soup. Panda and Redman wanted yellow rice with peas. Jeeps pointed out that the bag of kale in the crisper drawer was approaching slimehood and needed to be used. One soup pot on the back burner. Olive oil. Three carrots scraped and sliced. A can of cannellini beans, drained and rinsed. Half a pint of grape tomatoes. Saute all. Add chicken broth. Chopped parsley if you have it. Lower the heat, cover and let it do its thing. One skillet on the front burner. Olive oil. Five big cloves garlic, minced. Work it. Add half the bag of kale, toss with tongs. Cover and let wilt. Add other half. Salt and pepper. Toss. Cover and let it do its thing. Third skillet down. Olive oil. Half the bag of pre-cooked meatballs. Brown them. The stove now looks like this. Jeeps insisted I take the picture so I could prove I wasn't putting three different nights' dinners into one post. As if I would do such a thing. The kids had meatballs with their yellow rice. Jeeps constructed yellow rice, kale, and meatballs. I dropped meatballs and kale into my soup. Everyone was happy. And personally, I think mine was best. So when you first walk into Trader Joe's, there are, right inside the automatic doors, two big bins of whatever produce is usually on sale. Yesterday it was navel oranges and watermelons. On the chalkboard attached to the watermelon bin, it said, "Watermelon! Delicious in a salad! Try it with peach salsa, basil and gorgonzola cheese!" And I thought, "Um. OK. I'll do that." I always appreciate direction. So I bought a watermelon, gorgonzola cheese, and a thing of Joe's peach salsa (which I love anyway). Basil I already had in the garden. And today for lunch, I gave it a try. And wow! Hey! This was a pretty awesome salad. I love the watermelon and basil together, and the peach salsa gives it a nice kick. To be truthful, I am not a huge gorgonzola fan. I see the point of having the savory counterpart to the sweetness of the fruit, but if I try this again I will use feta cheese instead, and see if that's more in line with my taste. Still, for a summer salad, this one rocked, and went perfectly with the little bit of grilled chicken I had leftover from last night. Here's another one from my old recipe book of Martha Stewart clippings. The full name is "Cauliflower and Roasted Corn soup with Chanterelle Mushrooms (or How I Learned to Stop Worrying and Love the Fungus)." The kids were to be sleeping over my mother-in-law's so I was looking forward to making something adult-oriented. Panda came home from a birthday party with a stomach ache and ended up staying home, but she was only interested in saltines and applesauce so I could continue with the menu as planned. Jeeps was shopping in the vicinity of DeCicco's so I sent him in for a few ingredients, including aforementioned chanterelles, which I was positive DeCicco's would have. Alas, they didn't. After a little debate we figured baby portobellos would probably make a good substitute. Jeeps kept sending excited texts, such as, "This place rocks!" "Un-be-LEEV-able!" and my favorite, "Did you SEE the beer section?!" The excitement was warranted. DeCicco's stocks a minimal selection of wine but has an entire long wall devoted to artisan, hand-crafted and locally brewed beer. So home my baby came with his new suit, new shoes, shallots, mushrooms, bay leaves, fresh thyme, and a six-pack of Old Slugger. 1 1/2 pounds cauliflower, cut into florets. The recipe starts off with you roasting the kernels from one of the ears of corn at 400 for 5 minutes. 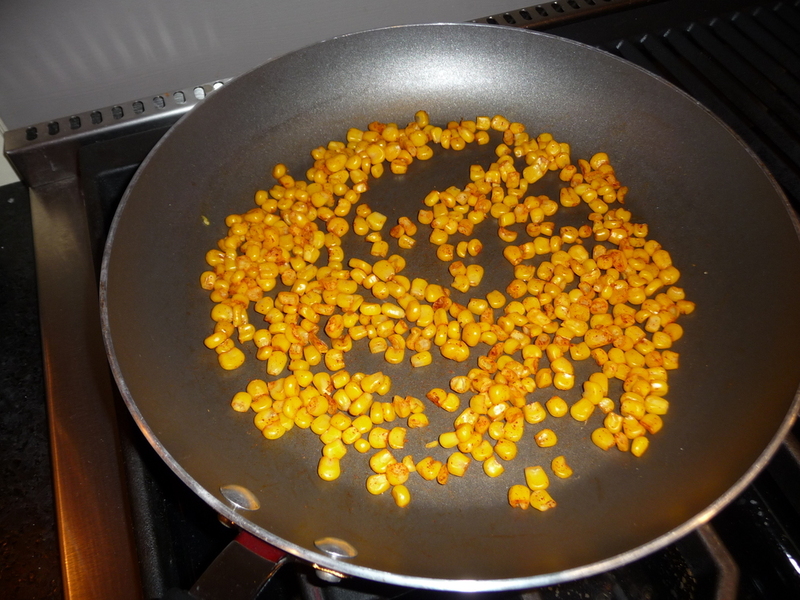 I had my one cup of reserved corn and decided to use a trick that my friend Cyd taught me, which is to toast the kernels on the stove with salt and spice. Drain the corn and pat dry as much as possible before putting the kernels in a dry, non-stick skillet on medium-low heat. Sprinkle with salt and a pinch of paprika. As with caramelized onions, low heat and long time is the trick. Just babysit them and shake the pan every now and again. Once they are nice and browned and crunchy, set aside. Melt butter in your soup pot over medium heat, add shallots, garlic, onion. Cook until translucent, about 4 minutes. Add mushrooms, continue to cook until mushrooms soften, another 4 minutes. Remove mushrooms from pot and set aside. Add unroasted corn, cauliflower, stock, bay leaves and thyme (Ms. Stewart advises to tie up the bay and thyme in cheesecloth to make a bouquet garni; if you have cheesecloth, go right ahead, but don't sweat it—at the end you just pick out the leaves and stems by hand). Bring to boil. Reduce heat to low and simmer, covered, for 20 minutes, until cauliflower is tender. Remove bay leaves and thyme stems and discard. Working in batches in blender, or with immersion blender, puree soup until smooth. Return soup to pot over medium-low heat. Stir in reserved mushrooms. Add cayenne and salt to taste. Serve garnished with toasted kernels and fresh chopped parsley. To go with the soup, I had a tube of Trader Joe's crescent biscuit dough. I haven't had these babies in years. They can't possibly be good for you but they are sooooo good. The soup was delicious. Even the invalid had a little bit in a ramekin, without the mushrooms. I am not a mushroom aficionado at all so I don't know what kind of difference the chanterelles would have made, but if I ever see them in the store, I know I'll be giving this soup another go. After the Dim Sum outing, the only thing I really felt like for dinner was soup, and specifically my coconut thai soup. I used to make this soup every Monday night when I came home from the city. Jeeps would have the kids at swim lessons and I'd be on my own for dinner. This was my go-to meal, Heaven and comfort in a pot. I could make as much or as little as I wanted, but I usually made enough to have a little for Tuesday lunch. Put your soup pot on medium heat and splash some olive or coconut oil in. Get your minced garlic smiling in the oil, and then add the ground ginger and a pinch of red pepper flakes (more or less according to your preference). If you want to just stop here and park your face right above the soup pot and inhale for five minutes, believe me, I understand. The smell is divine. When you revive, add the carrots and saute another 5 minutes. Add the coconut milk, scraping out the can with a small spatula. Stir well, then add 2 cups of low sodium chicken broth. Bring to a boil, then turn heat to low, cover, and simmer until carrots are tender. The trick is to taste the broth and taste some more before you start fiddling with additional seasonings. Start with a teaspoon of asian fish sauce and a tablespoon of lime juice. I also like to add some baby spinach and some chopped scallions. By the way, did you know that you can buy fresh scallions, chop and freeze them? 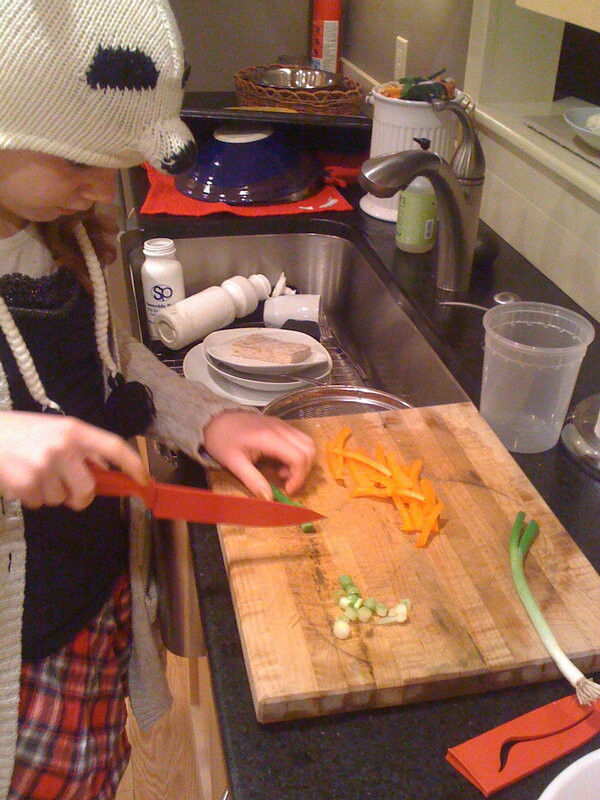 They keep very well and I was happy to discover this—I like using scallions in cooking but seem to do so sporadically. More often than not I end up with limp scallions in the crisper drawer just when I need them most. 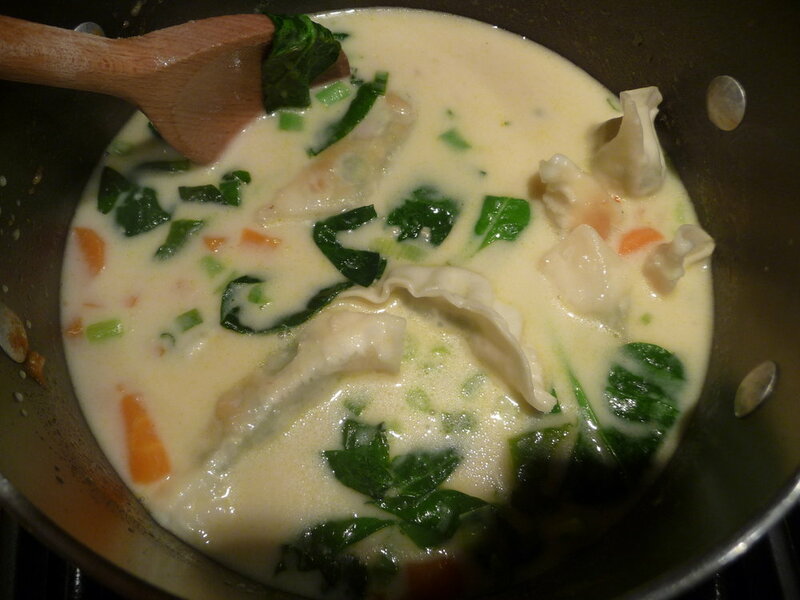 When the broth is properly salty and sweet and sour and savory, add the gyoza and simmer another 5 minutes. If you have fresh cilantro on hand, chop some of that and add. This soup is great when you have a cold—all that garlic and ginger and the red pepper flakes make your nose run like crazy. It's awesome. I couldn't think of anything for dinner tonight. I felt like I had to come up with something spectacular for the sake of the blog, but since this is a blog about real life, then those nights when I can't think of damn thing for dinner get included. Even take-out will be included. So there. No shame in frozen pizza. And by the way, have you tried Trader Joe's Tarte d'Alsace? 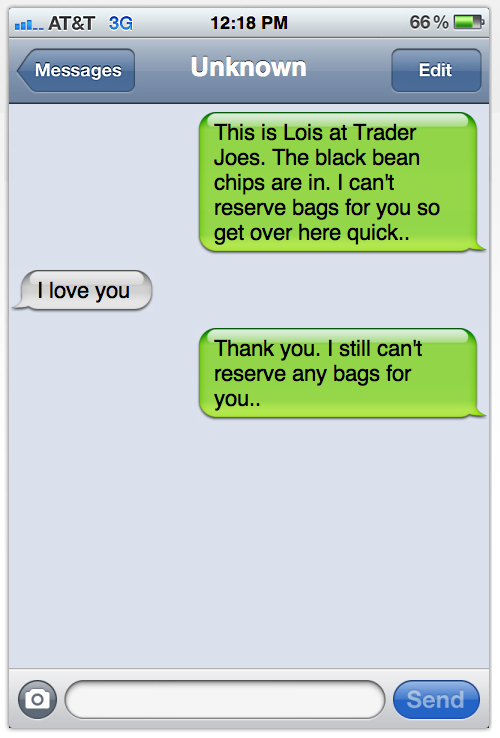 Actually, correction, it's not a Trader Joe's branded product, but they sell it there. It's made by Maitre Pierre but it is delicious—flatbread with gruyere cheese, ham and caramelized onions. Pandagirl will eat a whole one herself. So will I. And speaking of Panda, she came up with the idea of making Good Luck Salad tonight, so we will be joined by my lovely sous-chef. In her lovely panda hat. My delicious friend Claudia taught me about Good Luck Salad, which is traditional New Year's fare in the south. We're pretty addicted to it up North here and eat it at any given opportunity, which is why my pantry is always stocked with black-eyed peas and hominy. And voila, an excellent accompaniment to your frozen pizza on a night such as tonight, and a perfect dish for your aspiring young cook to put together.